You’re probably looking for an EbonyFlirt review that’s why you came across this article. The good news is, you have come to the right site! Get to know everything that there is to know about EbonyFlirt by reading the information provided below. Whatever your skin color is, it can be challenging to find a date especially with how busy our lives can be. This may be the reason why more people are turning into online dating sites because of the convenience that it has. One of the many dating sites today is EbonyFlirt, which caters to black people who are looking for a date. 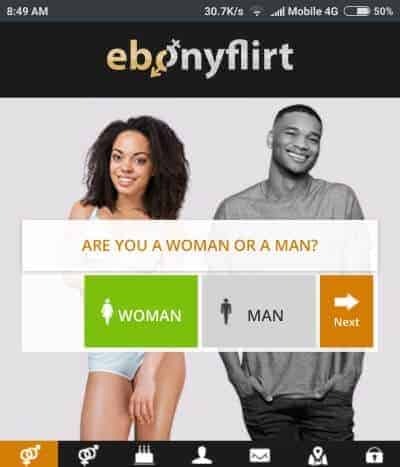 With the many black dating sites, you may be wondering why you should or should not sign in to EbonyFlirt. Let’s all find out by reading the information provided for you below. As mentioned above, EbonyFlirt caters to black people who are looking for dates. Unlike other dating sites that can access people from all over the world, with EbonyFlirt, it’s different. There are some countries where EbonyFlirt is not available for an unknown reason. But if you are living in one of the countries where EbonyFlirt can be used, then every information here is relevant. Gallery — The gallery is where you can check out the photos of members and choose whether one is hot or not. Account — This is where you can edit your account. You can also change your password and start uploading photos here. Activity — You can see who winked or visited your profile. Chatrooms —You can communicate with other members by chatting with them. Email — This is where you can email them, and read the email sent to you by other members. Online — You will be able to see who is online so you can chat with them when needed. Search — You can use this to search for other members who are online now, members with photos, or members of a specific age and location. Now that you have read all of the basic stuff about EbonyFlirt, it would be best to know what’s behind the online dating site. Go ahead and read more of its information below. One of the main complaints that people are getting about EbonyFlirt is that their information can be reused by the site freely. This is according to the terms that are written specifically by EbonyFlirt. The website has the right to sublicense all information, broadcast, distribute, translate, copy, reuse, and take all of its members’ information. Some of the other information that they can share are your interests, description, chats with other members, name, and your images. This means that your data can freely be shared and reused by other dating sites and any other sites that are affiliated with them. There are also a lot of fake profile accounts wherein they are made using information of other people. These profiles are known as Staff Profiles, which is used to full the dating site up if there are not enough people signing up. This is also the reason why EbonyFlirt is using the information of its members so they can create a profile on other online dating sites. So the possibility of seeing people here that are made by other people are very much high. Another bad thing about EbonyFlirt is that their memberships are quite costly. The site will have to ask for your credit card information before you get to know some of the features of the site. A lot of members are doing bad reviews because they need to upgrade their account before they get to open messages from other members. What’s worse about this is that they will even send you messages using the fake profiles that they created. So in short, the members will then be forced to upgrade to see that message. With all these being said, I suggest looking at other black online dating sites. Other online dating sites are much better and a website that won’t force you to upgrade your membership just to read fake messages from fake profiles.